What are the Advertising Rates for FoxRunTavares.com ? Is the Fox Run Homeowners' Association liable for anything that may be found on the website? No. The site and its contents are the sole responsibility of the Fox Run Computer Club. Is this the official site of the Fox Run Homeowners' Association? No. The website is a project of the Fox Run Computer Club, and is built, maintained and paid for by the Computer Club as a service to Fox Run residents. Isn't the Fox Run Computer Club an official part of the Fox Run Homeowners' Association? No. The Fox Run Computer Club is a separate, non-profit organization. The website's purpose is to create greater communications among Fox Run residents, and to provide a sort of electronic "Bulletin Board" for Fox Run activities. 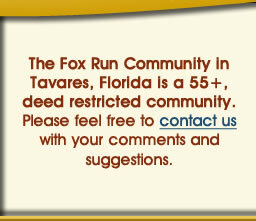 Fox Run is in beautiful Lake County Florida, about 35 miles north of Orlando. There are public and resident-only sections of the website. Any resident can request a user name and password to log into the resident parts of the site. Their identities will be verified by the administrators of the site. In addition, Fox Run Clubs, Committess, and HOA management may designate individuals who can modify the contents of their areas of the web site. Will there be editorial content from the Computer Club on the website? No. History shows that community websites that are allowed to become politicized can become divisive and counterproductive for the residents. The Computer Club will not publish its own opinions on Fox Run issues, and will only publish submitted Club and Official HOA news articles. How do I contact our HOA's Management Company?